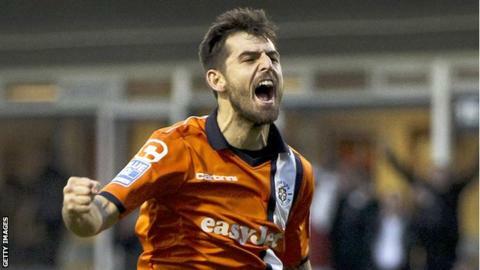 In-form Luton strolled to their seventh straight Conference Premier home win with a dominant victory over Gateshead. Paul Benson nodded in Alex Lawless's cross to put the Hatters ahead before Lawless doubled the advantage with a left-foot finish from a tight angle. Andre Gray fired in his 13th goal of the season on the half-hour and Lawless added a fourth after the ball was parried by Adam Bartlett. John Oster and Liam Hatch pulled two late goals back but Luton held on. "I'm really pleased with our performance. We conceded a couple in the second half; one I disappointed with, one I wasn't. But I'm delighted with the performance, and obviously delighted to win. "The power of our play is fantastic at the moment, and I think it can grow as well. Looking at today, obviously I've got to be delighted. "With Alex, with Paul and Andre; we have people that can score. Luke Gutteridge can score. And even not playing, we believe very strongly in Alex Wall and Mark Cullen, we've got lots of goals within the football club. "We're never going to play at that tempo for 90 minutes, it's not possible. But you hope you can play it long enough to win the game. And obviously, in front at half time, we've got to be awful in the second half to not win it." Match ends, Luton Town 4, Gateshead 2. Liam Hatch (Gateshead) is shown the yellow card for a bad foul. Foul by Liam Hatch (Gateshead). Second Half ends, Luton Town 4, Gateshead 2. Andre Gray (Luton Town) is shown the yellow card for a bad foul. Foul by Andre Gray (Luton Town). Lewis Sirrell (Gateshead) wins a free kick. Foul by Marcus Maddison (Gateshead). Pelly Ruddock (Luton Town) wins a free kick. Paul Benson (Luton Town) wins a free kick. Foul by Lewis Sirrell (Gateshead). Andre Gray (Luton Town) wins a free kick. Attempt blocked. Paul Benson (Luton Town) right footed shot from outside the box is blocked. Adam Bartlett (Gateshead) wins a free kick. Goal! Luton Town 4, Gateshead 2. Liam Hatch (Gateshead) header from the left side of the six yard box to the bottom left corner. Assisted by Phillip Turnbull with a cross. Foul by Joe Davis (Luton Town). Liam Hatch (Gateshead) wins a free kick. Substitution, Luton Town. Matt Robinson replaces Luke Guttridge. Attempt missed. Pelly Ruddock (Luton Town) right footed shot from outside the box is too high. Attempt saved. Alex Lawless (Luton Town) right footed shot from outside the box is saved. Substitution, Gateshead. Michael Cummins replaces Josh Walker. Substitution, Gateshead. Robert Ramshaw replaces Colin Larkin. Attempt missed. John Oster (Gateshead) right footed shot from outside the box misses to the right. Goal! Luton Town 4, Gateshead 1. John Oster (Gateshead) right footed shot from the right side of the box to the bottom left corner. Assisted by Liam Hatch. Ron Henry (Luton Town) is shown the yellow card for a bad foul. Foul by Ron Henry (Luton Town). Substitution, Gateshead. Marcus Maddison replaces Adam Boyes. Attempt missed. Luke Guttridge (Luton Town) right footed shot from the right side of the six yard box is too high.